Peace and serenity are pillars of Nepalese spiritual culture. Naturally, in the birth country of Buddha, one hopes to seek out a small slice of the profound peacefulness that brought Siddhartha to enlightenment here. It’s thought that he sailed a ferry boat across a river and came to enlightenment largely by learning from that river. Not unlike him, I found some moments of nirvana sailing on the water (after running aground). 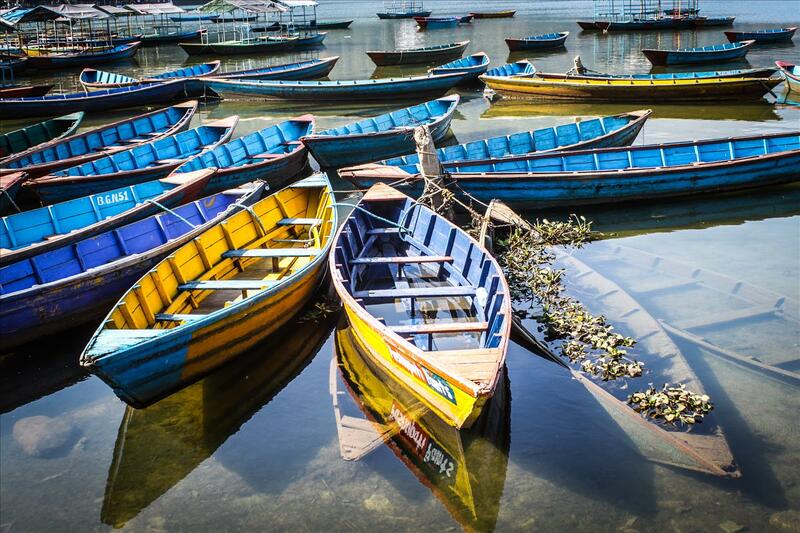 On the bank of the Phewa lake lies Pokhara: a quaint lakeside town. Falcons circle the sky with meter wide wingspans, the snowy Annapurna mountain range presides in the distance, crystal clear water floats crayon colored row boats, unsupervised cattle stroll leisurely street-side: it’s like walking into a landscape painting. Shane and I took a walk along the lake on his birthday in hopes of getting out on the water. We passed a few row boat rentals that reminded me that I haven’t worked out in over a year and have obtained teacher arms. Arms whose most strenuous tasks include writing out numerous grammar forms on a white board while holding a book, erase, repeat. Yeah, I do like at least 30 sets of those a day, I should be able to do my share of rowing on a boat…not likely. That’s when a sloop caught my eye. The double sailed demur beauty sat alone among the wooden boats like a beacon of hope. After not sailing for over a year, I was a little nervous to get back out on the water, but over the moon excited also. We got some wine to dull the nerves, some delicious Nepali yak cheese, and crackers for lunch and set out for a classy cruise on the lake. I captained the humble vessel and Shane basked in his first day of 25 year-old-ness. $15 got us four hours of serenity. 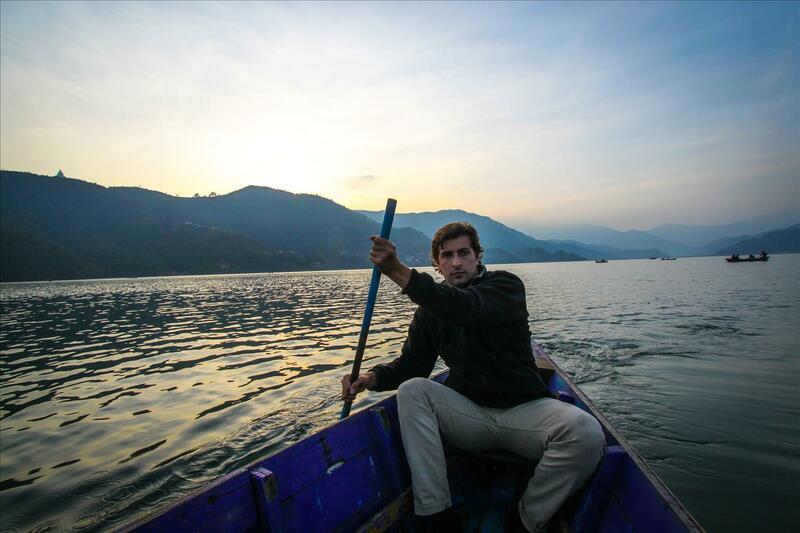 Nothing beats the quiet of being out in the middle of water, the only sound being water rippling alongside your boat; looking at the Himalayas, and thinking man, I’m really small, like not just 5 feet 4 inches short: like in the world small. Then thinking, god, this place is beautiful …until eventually your mind clears and you think nothing, but in a good way. Aaaannd then the wind pushes you and your peaceful mind to the edge of the lake at a 90 degree angle beyond way of redemption, and you think damn I’ve just run aground. Threats of mutiny hung unspoken in the air. Okay, so maybe I wasn’t the best captain, but all great captains can make mistakes, take the renowned Captain Jack Sparrow for instance: totally not perfect either. Looks like those weak teacher arms were in for a work out after all. I tapped into the Pop-eye spinach reserves in my mind and managed lowering the sails, paddling out, then raising the sails. Crisis averted now back to your scheduled program of wine and cheese sailing nirvana. Falcons and paragliders circled and swooped overhead using the wind much the same as we were, fish swam below, and our little orange boat floated along propelled by air. Four hours of my life passed by like the wind in our sails. We caught time and held it riding it out as long as we could before having to tack, moor the boat, and paddle back to reality for a short while before returning a day later. I’m proud to say our second voyage, unlike our maiden voyage produced nothing but smooth sailing and there was no mutiny aboard our vessel. Thanks! It really was lovely! Love this, it sounds fantastic! Enjoying your adventure greatly and happy birthday to Shane!